This process works through either linear or orbital motion of one part relative to the other. This results in surface friction that leads to heat generation and the formation of a melt layer at the joint. Vibration welding typically has weld times from one to five seconds. Dukane’s vibration welders can handle parts from approximately two inch (50 mm) diameter to six feet (1800 mm) long. 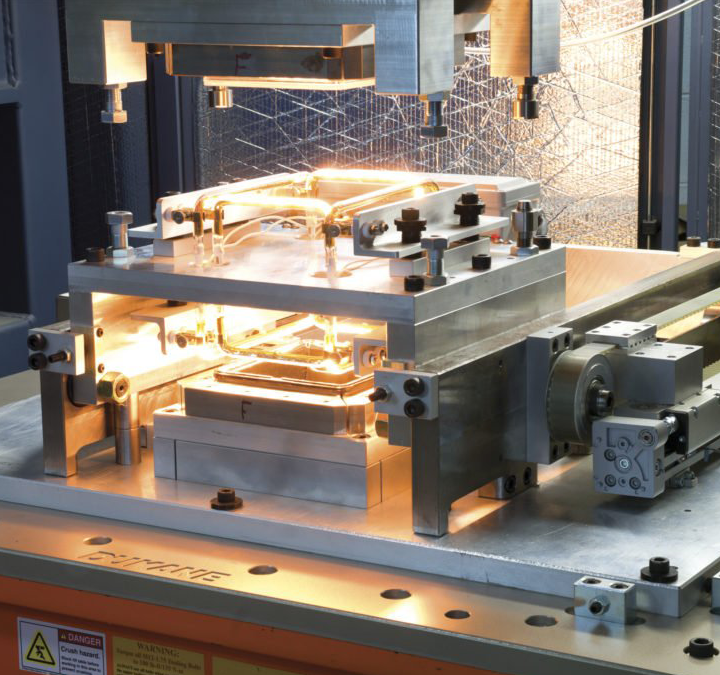 Laser welding is a non-contact joining method that uses a laser beam to melt the plastic in the joint area by delivering a controlled amount of energy to a precise location. Precision in controlling the heat input is based on the ease of adjusting the laser beam size and the range of methods available for positioning the beam. Most thermoplastics can be welded using a proper laser source and appropriate joint design. Another non-contact welding method is infrared welding that uses radiation to transfer heat to the plastic parts. It follows the same fundamental steps as hot plate welding. Two different approaches to infrared welding have emerged. One of the systems uses an electrically heated metal plate which, in some cases, is coated with a ceramic. In the other system, the standard heater plate is replaced with infrared emitters clamped and spring-loaded on either side of a movable platen. Fabric & film processing is the bonding, slitting, or sealing of fabrics and films containing thermoplastic material(s). Typical thermoplastic materials found in fabrics and films include acrylics, nylon, polyester, polyethylene, polypropylene, polyvinylchloride, and urethane. Products from the textile, apparel, nonwovens, packaging, medical and automotive industries all benefit from the fast, clean, and economical fabric & film processing techniques.